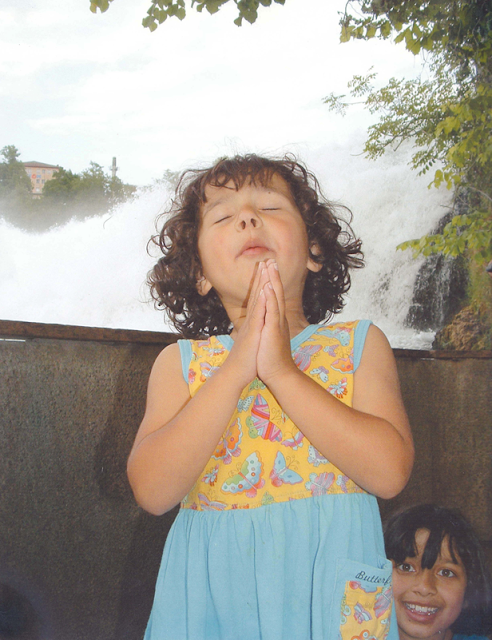 Irene at 4 in Switzerland, thanking God for the waterfall and Zoe behind her. 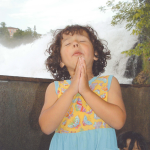 Once, when we were travelling in Switzerland with Irene aged 4, she needed the loo in a mall. The lady who left the loo held the door open for her, and she entered, omitting the 25 centime coin you pay to open the door. “Aww,” said the dour Swiss lady, in spite of herself. And so, she often wants to skip church to do beautiful homework. And I don’t let her skip church. She is fit and strong, friendly, and clever. But, if she does not develop the fourth dimension of her personality, her spirituality, she might well “limp” in life. And, so we insist in active involvement in church, and youth group—and once she gets there, she enjoys it. I remember the excruciating boredom of church. I went to a Catholic boarding school and had to go to Mass 5 days a week until I was 16; to 2 choir practices a week; a hour of Benediction every Sunday, an additional hour of contemplative prayer, “Adoration” every first Sunday; Blue Army in Middle School, Catechism 5 days a week…Oh, I am sure there was more. Like Irene, I have a freak verbal memory. Both of us can memorize poetry or well-written prose very easily, almost without realizing that we are doing so. So I emerged from all that forced religion knowing the Gospels almost by heart. (This helps in learning other languages; when I read them in French or the original Koine Greek, it’s easier, because I pretty much know them by heart in English.) I know the Psalms almost by heart, and Proverbs because I heard them read out every day in my childhood, and of course, have read them, and listened to them on tape often as an adult. In times of stress, and crisis, and emotional need, comfort came to me in the words of hymns I learned as a child; psalms I had unconsciously memorized as a child; or the words and actions of Jesus when I knew so well. Wisdom, guidance, comfort, peace. And so, I believe there is some value in requiring children to go to church, because of the repository of wisdom they absorb! Irene, however, does know her Gospels very well. We play them in the car on family trip in a variety of translations, and frequently read a chapter after dinner. 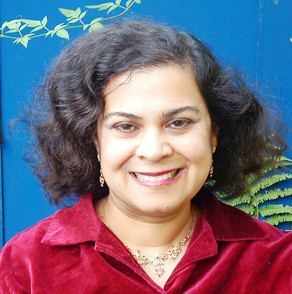 You have been writing so much what I've been contemplating lately – how do you do that! My children are 8, 6 and 3. The older two are starting to believe for themselves. How do I teach them a faith that has deep roots? How do I disciple them, teaching them to pray and soak in God's presence, especially since I'm still on that journey myself? Thank you for your encouragement. Hi Christine, Indeed. Faith is a relationship they have with God, and there is nothing we can do to produce it in another. Probably modelling life of joyful trust with faith interwoven into the fabric of one's life is the best way. Ultimately, the only way we can influence their lifelong choices is prayer. But hanging in there with church attendance has been useful for me as a child and adult, so I guess I am instituting it as a family rule!! I gave up on church (The Church of Scotland) at about 10 – the sense of God survived, I'd say, till I was 13 and then left me. It was a further 11 years before that awareness returned, in the context of beauty, liturgy and music found in the (Scottish Episcopal) Cathedral of The Isles – and also in the context of bereavement. My own sons attended church faithfully, as choristers and servers, until they were 20 or so and at University. They have not returned, but I still hope they may some day. I have a feeling that we do what we can and then leave the rest to God. Hi there, Jen. I love it too! How are you? “So I emerged from all that forced religion knowing the Gospels almost by heart.” — not a bad outcome!! I absolutely love that picture of Irene.